Many years ago, an emperor of China desired to know how the commoners of his country lived, so Emperor Long dressed in disguise and walked among the people. His servants refused to let him go alone, but he forbade them to reveal that he was the emperor. During his time with the commoners, they found an inn and ordered some food. During the meal, he poured his servant a cup of tea. The servant, horrified that his emperor would serve him, wanted to show his gratitude, so he tapped his first two knuckles on the table as if his fingers bowing. The tradition has continued since the mid-1700s as a quiet way to show your gratitude. Conversation flows with the tea as two fingers tapping on the table became a silent way of saying thank you. But the servant could not, not even for a moment, ignore who the emperor was. It wasn’t Emperor Long’s clothes. It wasn’t a throne. It wasn’t even something he could take off and put back on again. He was the emperor, sitting in rags at a peasant’s table or sitting on his throne. This was his identity. And it was never to be forgotten. This story makes me think of a queen from quite a different country. But when this queen changed her wardrobe, she got a little confused. Susan Pevensie forgets who she was. We see this in The Last Battle by C.S. Lewis. In Chapter 12, Tirian has found himself in Aslan’s Country with Digory, Polly, Peter, Edmund, Lucy, Eustace, and Jill. Tirian asks where Susan is. C.S. Lewis has been greatly attacked for these comments about Susan and lipstick, some labeling him sexist and afraid of women. Yet I truly believe that those who impugn him for this section from The Last Battle have a limited understanding of Lewis and of what is being said here. He never says that they were only royalty in Narnia. No matter where they go, what they do, or what world they are in, they are always a king or queen. Much like the emperor in China leaving his throne and dressed in peasant robes, he was still an emperor. We don’t know the exact words that Aslan said to Peter and Susan when they were leaving Narnia for the last time, but we do know what he said to Edmund and Lucy in The Voyage of the Dawn Treader. Aslan never once says that their time of being royalty is over. In fact, he lays on them a harder quest than they had ever experienced. Find me in the noise, find me through the rebuilding from the war where lives, homes, and building have been shattered, find me as you finish school, find me as you venture the path to adulthood, find me as the pressure to be the prettiest or smartest or most popular becomes a game no one wins. Find me while you are finding yourself. For reasons we can only guess, Susan Pevensie doesn’t find Aslan in our world. Perhaps this is the very thing that makes her forget Narnia. For if your eyes are not fixed on the Giver of Life, can you really know who you are? C.S. Lewis isn’t saying that it’s wrong to grow up, but his idea of the definition of maturity is different than the world’s. Susan Pevensie replaced Aslan with lipstick. I wasn’t allowed to wear makeup until I was 16. I didn’t really care. Wearing makeup was a milestone that I did look forward to, but it didn’t define who I was. I have never felt like being a woman has anything to do with whether I wear lipstick or not. Makeup has nothing to do with who I am or what I can accomplish. In fact, to me, makeup is more about changing my body so that others find me more attractive. Maybe other women are different, but one of the main reasons I find we use makeup is so that others think we are beautiful. According to a University of Manchester statistic, a man will stare at a woman wearing red lipstick 7.3 seconds but will only look at a woman wearing no lipstick for 2.2 seconds. 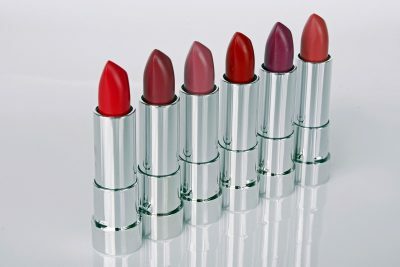 Women will use approximately 9 pounds of lipstick during their life. 90% of women wear it only to feel better about themselves. In 2007, 82% of women said they felt less confident at the workplace and dating if they didn’t wear lipstick. In fact, during World War II, Winston Churchill encouraged women to wear lipstick. He had two reasons. First, he wanted Hitler to see that the war didn’t dictate how they lived their lives. But Churchill also knew that lipstick is a powerful boost to morale. Don’t forget that C.S. Lewis lived right through this. World War II was a challenging yet exciting time for women. As more and more men were killed or badly wounded, it was necessary for women to fill jobs that were seen as work only for men. Suddenly women became nurses, drove tractors, flew bomber planes, joined the military and other things that were previously unheard of for women. Lipstick played two roles: to highlight femininity while doing “men’s work” and to empower women that they could do what was asked of them. 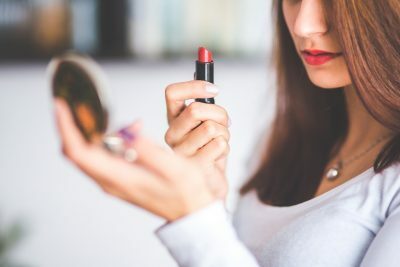 Lipstick still gives women confidence while making us feel better about ourselves. When I do a book signing, I use some to make myself look professional. If I’m running out the door with my three small daughters in tow and feeling like I’m not looking up to par, I slap on some lipstick. But using lipstick to find your beauty and confidence will never satisfy as its effects only last a short time. As Susan Pevensie loses her identity as Queen of Narnia, she becomes engrossed in the physical world. 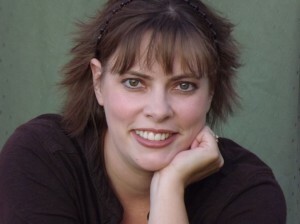 Think about Susan, Queen of Narnia! Yes, she’s deemed gentle, and we don’t see her in great battles, but think about what she accomplished – running a castle, taking care of the day-to-day life of Narnia and Cair Paravel, and entertaining royalty from other countries. Even an invitation to the best party looks awfully weak when compared to deeds Susan did in Narnia. But she becomes deeply superficial when her identity as the role of queen slips away. She finds small doses of confidence in lipstick – something that fades in hours – and misses the greatest identity in the world. In fact, the greatest identity in any world. Susan’s greatest identity wasn’t Queen of Narnia; her greatest title was Beloved by Aslan. We get wrapped up in the crowns and the castle when we read The Lion, the Witch, and the Wardrobe. But the children would never have become kings and queens without Aslan’s great love and sacrifice. Aslan could have sent the four children back to this world and allowed Narnia to perish under the White Witch. And while I will always long to visit Narnia just once, at least I share one thing with the Pevensies. I, too, have been made royal. I, too, have been loved so much that the Great King would lay down His life for me. And having sacrificed himself, Jesus rose from the dead. Through this action, I have been made a child of the King. Not just any king. But the King of all kings. When we approach life knowing that we are a child of the King, that God lives in us, that God saved us and loves us, we don’t need lipstick. Don’t throw out all your tubes. (On average, a woman has 20.) Keep it, wear it, enjoy it. But don’t let it consume you. When I forget God and rely on earthly items like lipstick to give me confidence or to make me feel worthy of love, I am focusing on the wrong source. When I place my identity in lipstick, I am Susan. But when I remember that I’m a child of the King, a King who loves me and fights for me. When I remember that my body may perish, but there is a place for me in His courts in Heaven, I will fear nothing. For just like Emperor Long, we may wear peasant robes, but our identity as Child of the King still remains. No wonder Susan Pevensie having lipstick is a huge deal to the world. 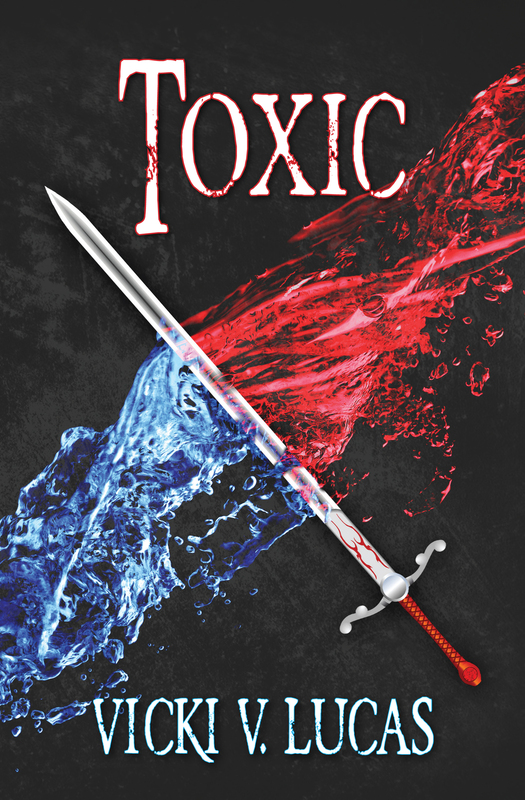 In their perspective, taking it away rips Susan’s armor off of her, a valuable tool to use during life. However, when my identity is firmly centered on what God tells me, the importance of lipstick fades. 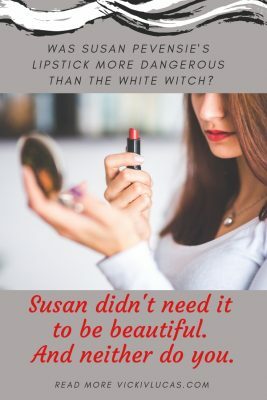 The point of this passage about Susan in The Last Battle wasn’t that she wore lipstick and was forever cast out because of it. Lipstick was only the symptom. C.S. Lewis was making the point that Susan put lipstick, nylons, and invitations above everything else — above family, faith, and God. Susan forgot who she truly was: a child of God, a queen of Narnia. Then she turned to fleeting, man-made things like nylons, lipstick, and parties. But Susan Pevensie didn’t need party invitations to feel like she belonged. She didn’t need nylons to make her feel special. She didn’t need lipstick for confidence.